Deepest apologies. When I used the shirt I was wearing to wipe the sweat off my face, I swear I thought I had on my sports bra. OPEN LETTER TO MY NEW DEODORANT THAT WAS SUPPOSED TO BE "POWDER FRESH" BUT REALLY STINKS LIKE GARDENIA. It's really hard for me to know who you are. And also, you don't look like that. Before we moved to the farm when I was 10 we lived in a typical ranch house in a typical neighborhood on a typical street. In my mind, that ranch house is large and spacious. When I trip through the memories of my childhood, the back yard of that home rambles. The trees are sturdy and elegant reaching endlessly toward the always blue sky. In reality that house on Gray Road is tiny. The yard is an afterthought and the trees … well, it's a good thing I only weighed about 40 pounds until I moved from there because those trees look small NOW with 30 years growth on them. A couple of years ago The Hub and I drove by the old homestead I laughed right out loud. THAT'S the house? It looked to me like someone removed about ¾ of it. Like it was caught in a shrinking machine. I thought back to the tales I told The Hub of the picnics we would have under the huge shady tree in the front yard. How we'd pack up the red flyer wagon and stroll off down the long driveway and nestle under the tree taking shelter from the sun in its never-ending circle of shade. As I looked though my adult eyes I saw that the driveway is about 20 feet long – if that – and the tree … well, it's a wonder all of our sandwiches fit under there – let alone ourselves. But it was home. And I loved it. I loved running up and down the hallway. I loved running the circle from the family room through the kitchen through the living room down the hall into and out of my parents bedroom through their bathroom and back into the kitchen. Round and round we'd run that course – sometimes just for fun and sometimes as a family game. I can remember the 4 of us – me, my sister, my mom and dad, lining up at the start line on one end of the kitchen. One by one we'd take off and rip our way around the course … kitchen, living room, hallway, bedroom, bathroom and back through the kitchen – we'd leap over each other to yank the plug of the clock radio out of the wall thereby stopping the second hand on the clock and finalizing our time. One by one we'd pant our way through the course …. Dad had the speed, but Carrie and I were smaller and could maneuver around the bed in the bedroom easier. We'd keep at it until it was either time for bed or until someone hurt themselves. Most often, someone would hurt themselves. But that's the price you pay for a little bit of family fun. My dad was always coming up with dumb games to play. Always. To this day, my family – now only 3 of us – will talk about the times we gathered around to fall on each other. That was one of our favorite games … The Falling Game. It was sort of a one-on-one type game. One family member would challenge another. The challengee would sit on the couch and the challenger would stand in front of him or her. Next the challenger would put his or her arms down straight at his or her sides and slowly begin to fall forward onto the person on the couch. That's it. That's the extent of the skill needed to compete in this game. You had to be a victim of gravity. Holy hell, I'm laughing right now thinking about it. As the faller got closer, the fallee had to sit and not yell or flinch. Same for the faller … no flinching. In fact it was a big game of falling chicken. Whoever flinched first lost. Most of the time, the fallee would screech out as gravity did its work on the faller … when this happened, the person falling would either stop falling or throw their arms out and catch themselves. Then we'd all burst into laughter. And someone would yell - Me next! Me next! Every so often, the person on the couch wouldn't flinch and the person falling wouldn't flinch and then you'd be treated to a great and mighty crash of the two. Which would usually leave 2 people laughing and 2 people hurt. And then, of course, the game was over. There was a lot of that in my house. A lot of nutty behavior. And looking back, I'm wondering if we ought to warn the current owners of a potential carbon monoxide leak in that home … I mean, what were we thinking? There was the lemon juice game where we all had to a take a tablespoon full of lemon juice and swallow it and try not to make a face. Whoever made a face lost and was out and the other three continued. If it got down to two very good players (or the last 2 tablespoons of lemon juice) then we'd up the ante … "this time," my dad would say, "you have to smile when you drink it! and no squinting!" And the game where we'd try to make the parakeet sing – he was a stubborn little bird, I can tell you that! There was the jump off the cliff game we played in Canada and nearly drowned … well Mom, Carrie and I nearly drowned. Dad stood on top of the cliff having NOT jumped and laughed and laughed. And there were about 100 singing games … and of course all the board games like Parcheesi and Sorry and Tripoli. All of which had at least two sets of rules … ones that applied to my father and ones that applied to the rest of us. When I flip through the memories of my childhood there is always some image popping up of the four of us sitting around (or falling around) playing games. There are many things I love about my father. Many aspects of his personality I admire and respect. Many characteristics of his I try to duplicate in my own life. My father was a great storyteller. He was wise. My father was a good motivator and a great leader. My father was funny – he could tell you a joke you knew and make you laugh as hard the 12th time as hard as you laughed the first time. My father had a great entrepreneurial mind and a thirst for adventure. He was a patient teacher (most of the time) and a gentle disciplinarian. But of all the things I love about my dad I have to say one of the most is that he was playful. Today is my father's birthday. Had he conquer the cancer that killed him and lived past 45, today Daddy would have turned 70 years old. I just can hardly believe that. 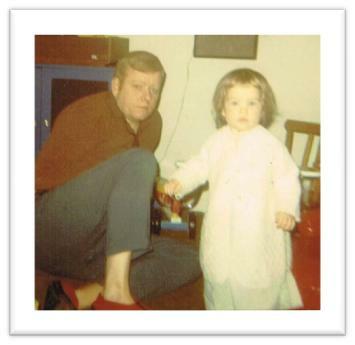 It really blows my mind to think that my daddy – my strong, vibrant, young father would have been 70. Not that 70 year olds can't be strong, vibrant and young but you know what I mean. I don't know how my father would have aged. I don't know if he would have been bald like his father or kept his reddish blonde hair. I don't know if he would be a Jack LaLanne type – trying to swim the English channel for a birthday present to himself, or only able to go out in a motorized scooter. I don't know if he would have kept up with current trends or if he would have been painfully out of touch with the here and now. I can guess, but I don't know. But I have to believe whether fit or fat, active or slow, bald or not, on this day after cake, ice cream and enough candles to rival the northern lights, my father would have looked at us all and said "Hey, who wants to play a game?" That's enough now. And also, I hate you.